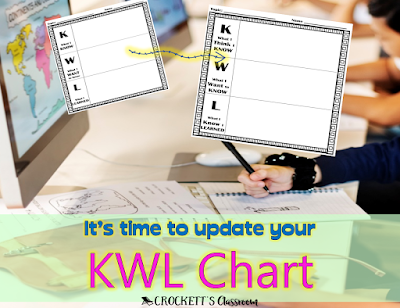 KWL charts have been around since the early 80’s. Chances are you’ve used them either as a student or as a teacher, maybe both. I remember thinking the traditional chart with three columns were wonderful. I used them for so many of my science and social studies lessons and thought they really helped my students organize their thoughts and learning. They guided a lot of our informative research and writing. K: background knowledge Students list what they know about the topic, characters, or setting. Students can even list what they know about the genre. W: Want to find out. Students can make predictions of what they think will happen. Predictions can be added or adjusted as they continue to read. Questions they want to have answered as they read the story can also be written here. Then if the question is answered it can be moved over to the Learned column. L: Learned from the story. Students can write a summary of the story, or the lesson learned in the story. Their predictions can be checked and their questions can be answered. K: Previous knowledge What knowledge do students already have about this topic. This could come from previous experiences, books they’ve read, movies or TV shows they’ve seen. It can also come from previous lessons or activities. W: Want to learn What do the students hope or want to learn about the topic. Questions are best for this column because they easily lead to searching for answers. L: Learned from the text Any facts and information that students learn from the text can be written in this column. The facts do not have to pertain to what they wrote in the W column. But, if they do answer one of the questions from the W column, it can be moved over to the L column as they write the answer. I really, really like this KWL chart. It values the knowledge that students already have about a topic but requires them to find evidence to support their ideas. Let’s face it, kids know a lot, but it isn’t always accurate. I also like the fluidity of this chart. Instead of writing on the chart, I like to have kids write on small sticky notes. These notes can then be moved from column to column as they read and research. 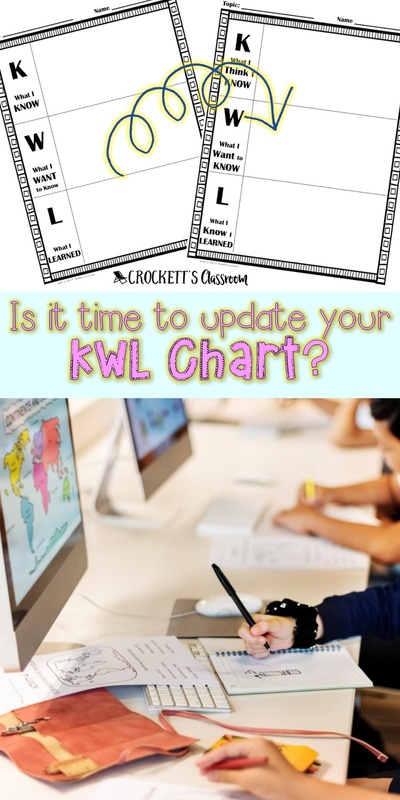 K: What I Think I Know- The first column is the biggest change from the traditional KWL chart. Kids can write down any facts, background knowledge or information they think they know about the topic. The emphasis, though, is that this “knowledge” may change once they begin researching or reading the text. Perhaps they write “bears hibernate” in the first column. But, from their research, they find out that they don’t truly hibernate. They go into a torpor or a deep sleep. Bears can be woken up quickly and easily from this torpor state, unlike hibernating animals. The note about bears hibernating can now be updated and moved to the last column- What I know I Learned column. W: What I want to Know- In this column students write notes about what they'd like to learn, or questions they have about the topic or story. As they read and research, they can update these notes with their new knowledge and move the note to the last column. L: What I know I learned- The last column is where all the notes from their research are collected. Only notes that have text-based evidence can be placed in this column. Notes from the first and second column are moved here as soon as they are proved by the research and reading. The next KWL chart comes from an article I read on the NSTA blog. It describes a KLEW chart. I like how this chart guides students through their research. 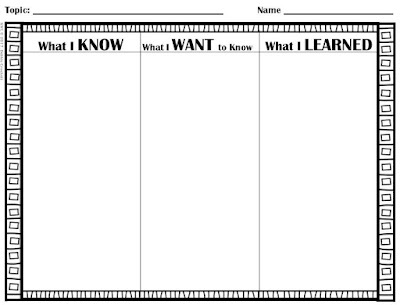 The first column lists what students think they know, just like in my Thinking KWL chart. 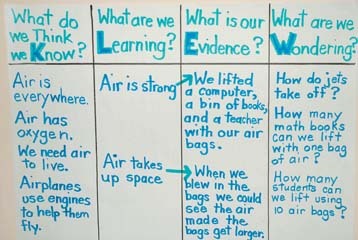 In the second column, they record what they are learning, followed by the third column which lists supporting evidence. The last column lists questions for future research. To read how a third-grade teacher used this in her science lesson you can read the full article here: Evidence Helps the KWL Get a KLEW. Check back soon. 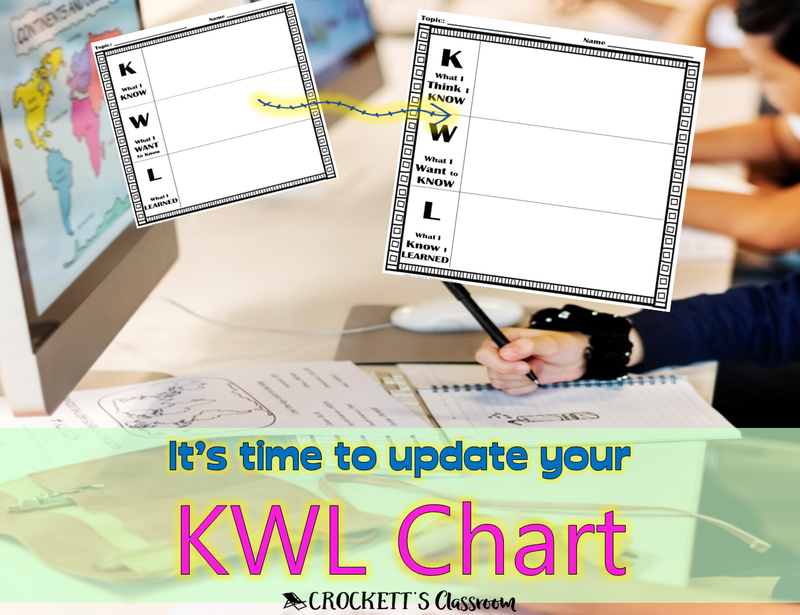 I'll be sharing more ways to use the KWL chart idea in your classroom.